Another federal deadline passed for seven states to wrap up work on a plan to ensure the drought-stricken Colorado River can deliver water to the 40 million people that depend on it. FLAGSTAFF, Ariz. (AP) — Another federal deadline passed Monday for seven states in the U.S. West to wrap up work on a plan to ensure the drought-stricken Colorado River can deliver water to the 40 million people and farms that depend on it. The states — Arizona, California, Colorado, Nevada, New Mexico, Utah and Wyoming — have been working for years on drought contingency plans. But Arizona and California have missed two deadlines set by the U.S. Bureau of Reclamation and still have work to do. Without a consensus among the states, the agency will allow governors from the seven states to weigh in with recommendations on what to do next. The federal government also could step in and impose its own rules in the river’s lower basin, affecting California, Arizona and Nevada. The comment period closes March 19, but the Bureau of Reclamation says it can call off the process if all states complete their work. The river carries melted snow from the Rocky Mountains to the Gulf of California. The water has allowed major desert cities like Las Vegas and Phoenix to flourish. But a nearly two-decade drought, climate change and demand from growing cities are increasing the threat of a water shortage. The water is doled out through interstate agreements, international treaties and court rulings. Users legally are entitled to more water than the river actually carries because the flows were abnormally high when the water was allocated in 1922. WHAT IS THE DROUGHT PLAN? Some of the best indicators of health for the Colorado River are Lake Mead on the Arizona-Nevada border and Lake Powell upstream on the Arizona-Utah border — the largest man-made reservoirs in the country. 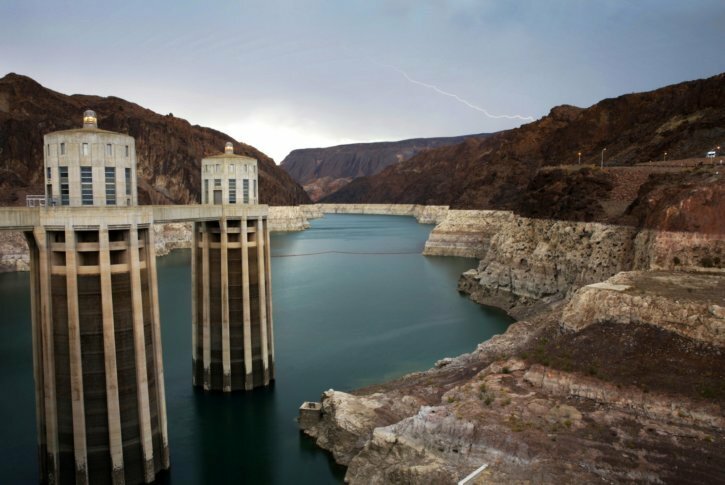 U.S. officials project each August whether Lake Mead can deliver a full amount of water to Arizona, California and Nevada. Right now, there’s a more than 50 percent chance of a first-time shortage in 2020. If there’s a shortage, Nevada and Arizona would face the first round of water cuts. California would never lose any Colorado River water because it has the most senior rights. Under the drought plan, Arizona, Nevada and California voluntarily give up water from 2020 until 2026. The cuts won’t prevent people from turning on their faucets at home. Much of the water will be stored behind Lake Mead to keep it from falling so low that it can’t deliver water at all. Mexico also has agreed to cuts if the U.S. completes the drought plan. WHY IS THE U.S. GOVERNMENT INVOLVED? The Bureau of Reclamation is the delegated “water master” of the Colorado River’s lower basin under a 1928 law that created Hoover Dam, which holds back Lake Mead. That means agency Commissioner Brenda Burman can step in if the states don’t work out a plan on their own. Her authority is broad and unspecified. Most water users believe any action she would take that’s not in line with the negotiated drought plan would prompt lengthy, legal challenges. “It’s much cleaner and much more appropriate to implement a set of plans that have been negotiated by the states and endorsed by a number of constituencies outside the states themselves, that have a general level of consensus,” former agency Commissioner Mike Connor said. California and Arizona have been seen as the holdouts. California more so now because some water managers want final review of the drought plan, and one irrigation district wants $200 million in federal funding to restore a massive, briny lake southeast of Los Angeles. Most states aren’t planning to submit recommendations to the Bureau of Reclamation right away and likely will incorporate some aspects of the drought plan in their comments. Colorado, New Mexico, Utah and Wyoming historically have not used their full allocations of water. The drought plan for those upper basin states is less focused on large-scale, voluntary cuts than ensuring Lake Powell has enough water to generate hydropower at Glen Canyon Dam. IS THE WORK DONE ONCE THE DROUGHT PLAN IS APPROVED? No. Water users in the seven states already are thinking about what to do when the drought plan expires in 2026. Hydrology, climate change, growth and demand all play a role. Farmers in central Arizona eventually will lose access to Colorado River water and switch to groundwater pumping. Developers will make decisions about where to build based on water supply. “If the DCP is put into effect and you actually get experience with implementing some of those larger cuts, I think that teaches you a lot about what the realities are about living with less supply than perhaps we all have become accustomed to,” former Reclamation Commissioner Estevan Lopez said.